In 1917, Mr. Onésiphore Brouillard began to deliver the milk to the convent and the village bank. In 1939, Rosaire, his son took over the business. In the beginning, the small Brouillard Dairy delivered milk to its clients by horse and cart. In 1950, Rosaire bought Mr. Arsène Desrosier's run and in 1955 Mr. Josaphat Comtois and Mr. Louis Joyal's route was purchased. In 1939, a quart was sold 5 cents an in 1966, it was 23 cents. 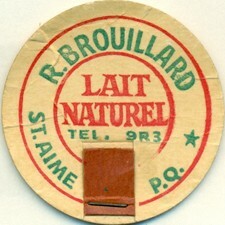 In spite of difficulties caused with pasteurization, Mr. Brouillard continued delivery until 1966. That year, "Chalifoux Dairy" took over all of Mr. Brouillard's runs in the area. Bottles were round and square and caps were identified with his name.